Using weed killer seems inevitable, especially when good intentions alone or highly recommended organic options fail to get rid of weeds. The common recourse is to grab a bottle of commercial weed spray, or a bag of Weed and Feed, when you notice it on display in most any store.That may work, to a certain extent. But things can go wrong, especially for those who don’t read the label! Do you prefer to know something about what you’re doing when you use chemicals around your family or pets? Would you like to understand some basic truths about weed killers, the good, the bad, and the exceptions? Information in this article is slanted toward the use of herbicide products specifically on lawns. However, most of it will prove useful for spraying weeds in other parts of your yard or garden. Satisfaction with a product comes when you have reasonable expectations about the results. It may seem like the best product SHOULD kill everything you want it to kill, in one application, with no negative results, and very little bother. Lawn weeds may die after one application of weed killer. Additional spraying may be required for more mature weeds, for perennial weeds with stronger root systems, or for some stubborn types, especially those with waxy or hairy coverings. Perennial Weeds = hardy weeds, like dandelions, that keep returning. By their nature, they survive season to season, unless you knock them out. Stubborn Weeds = do not readily absorb herbicides, or drink it down and laugh in the face of danger (probably genetically modified by mad scientists). Weed killer does NOT work better with a stronger concentration. It is better to spray again, rather than go with a heavier dose which can have negative consequences. Weed killers take time, more or less. Some work quickly, within hours you may see dieback. Others work slowly and may take many days before you notice any result. A fast weed killer is usually non-selective and kills everything it touches, especially the lawn. What matters is getting the best killer for a particular weed. Temperature and the rate of growth affect the reaction of many weeds to chemicals. Liquid weed spray usually provides better weed control than a granular product. You can cover more thoroughly or do spot treatment of lawn weeds with a liquid. Liquid weed killer is sold as a Ready-To-Use product or a Concentrate. The concentrate can be used in a spray bottle, a pump-up tank sprayer or a hose-end sprayer. CAUTION: Do not use a fertilizer sprayer like the Miracle-Gro type. A hose-attached sprayer must have adjustment to vary the strength of concentration. Sprayers used for chemicals that kill weeds should not also be used for fertilizers. Failure to clean out all residue may kill good plants later. The herbicide that is added into Weed-and-Feed fertilizer is forconvenience, not effectiveness. For early control of a smattering of weeds, it can be helpful. For a serious infestation of lawn weeds, it will have limited results. You would need to reapply soon, but your lawn will not need additional fertilizer at that point. So concentrate on one task at a time if both the lawn condition and weed presence are significant issues. Caution: be certain that the product you choose specifies on the label that it is safe to use on all lawns, or on your grass variety. Some grass lawns are more sensitive than others. Read and follow all directions. Do not merely glance over the basic info on the back of the bottle. Be aware that on most garden chemical bottles you can peel back the label for additional useful details. Each chemical is different. Don’t assume that the mixing amount is the same for different brands of the same product or for similar products. A common restriction on weed killing products will state it is safe for people and pets to go on the lawn once the spray has dried. Check to confirm that. Use your judgment here to reduce chemical exposure to a minimum. Wondering what happened to the good old stuff that used to work for your Dad? The chemical industry is continually introducing new garden products. They regularly remove old products, often due to environmental regulations, sometimes because it is not profitable for them to incur the cost of maintaining registration on a label. Trust the new ones, if you have been attentive with your choice. It pays to look around at the options when you are in a garden department with an extensive selection. Double-Duty weed killer products can be an effective way to tackle multiple problems. For example, a basic herbicide is a broadleaf weed killer safe to use on most lawns, but it would not affect crabgrass. It is now possible to get the same broadleaf killer with a crabgrass killer added. This may cost more than the original single formula, but not as much as getting two separate products, and you have less labor. Be cautious, however, about trying Neighbor Ned's boast about mixing his own garden cocktails. Chemicals that are combined can increase phytotoxicity (plant sensitivity and reaction to chemicals). A mixture might be harmful to a plant even if both chemicals alone would not be. This is another reason why you should not increase the dosage of chemical in your spray mix. This will kill most broad-leaf weeds without hurting grass. Different brands have 2 to 4 active ingredients geared toward different types of weeds, or with a different mode of action. Always verify that it will be safe on your type of grass. These are NOT safe to use on your lawn. This is a very specific killer. One called SedgeHammer, formerly Manage, should be safe to use on most grass lawns and is very effective. Some older weed killer products claim to kill nutgrass, but the active ingredient is MSMA, which is more commonly used to kill crabgrass. It may work alright, but check carefully about the safety of your grass variety. 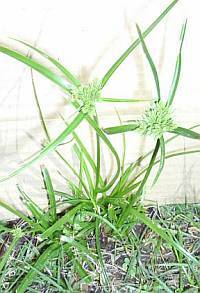 This sedge killer is not always found at retail garden departments. Grab it Sedgehammer at Amazon, or at Do Your Own Pest Control, linked previously. The well-known Round-up is the best example of this. There are many generic versions that offer the same active ingredient, though not the same surfactant which helps absorption. They may be useful to you if you plan to kill everything prior to replanting a lawn. Also, if the weed density is so heavy that the grass has been overtaken, you may decide to use this type, avoiding overspray as much as possible, and plan to reseed the bare area later. Bermuda grass is a creeping grass that is used by some as a lawn grass. 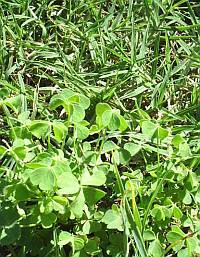 Other people consider it a weed when it invades their lawn of fescue, rye or bluegrass. A particular weed killer developed to kill broadleaf weeds was found to be effective in controlling Bermuda grass in turf. This product,Turflon Ester, is great for those who need to remove Bermuda. It will take numerous applications, 30 days apart, so start early in the growing season. But it would otherwise be impossible to eliminate Bermuda in regular turf, so check this out (and read all limitations and warnings about some grass types). A new series of articles addresses that last mentioned problem. Check out these articles for detailed information on the topic of killing bermuda in a cool-season grass lawn. When selecting a weed killer, take the time to determine if it makes the necessary claim to be both effective and safe for your situation. Grass endures constant stress, and keeps on growing. That is why we love it. No other plant can handle the abuse of constant pruning, being walked on, having the soil around its roots compacted, endure heat, cold, too much or not enough water, and still keep growing!Spraying chemicals is one more added stress, so reduce the impact as much as you can. Avoid spraying in extremely hot weather. Temperatures above 85 degrees will amplify the stress on the grass and cause damage. It is best to wait for temperatures below 80 degrees. Some apparent damage to lawns is not unusual after spraying chemicals, especially in hot weather. This wonderful plant will usually grow right through it, and the damage should no longer be visible after a couple of mowings. Do NOT apply any chemical product to young grass. It does not have the same resistance to chemicals as mature grass, and will probably be burned, possibly die. Three months is the absolute earliest to try it, and don’t go heavy on the concentration. Waiting 4-5 months would be a better approach, unless the manufacturer indicates otherwise. NO rain or irrigation for 24 hours is commonly posted, since many weed killers need to remain on the foliage that long. Check to be sure, then plan your spraying accordingly. In hot weather, consider watering your lawn the day prior to spraying to give it more resilience. Do NOT mow the lawn for 2-3 days before you spray. Weed killers must be absorbed into the leaves of the weed, and short weeds drink up less chemical. Wait at least a few days after mowing to spray, and do not mow for several days after spraying, which can allow more chemical to get down to the root. Remember, the earlier you attack the weeds in your lawn, the easier it is to get rid of them. If it is later in the season, just be persistent. Make plans to prevent weeds next year with preemergent and building up healthy soil and grass. Check out the rest of the Lawn Care site for help with doing that! Go to Lawn Weeds general info page. Go to Home-Made Weed Killer for an interesting diversion. Go to Home Page of Lawn Care.